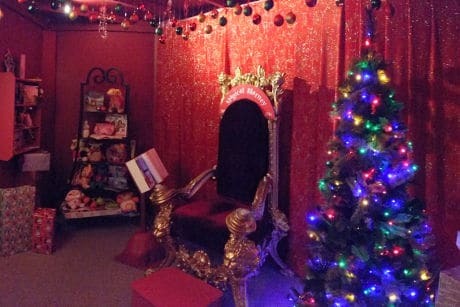 PARTNER NEWS: Children visiting Santa’s Grotto in Blarney Woollen Mills, Ireland, are being given NFC wristbands that are pre-encoded with information provided by their parents. As a child approaches the grotto, the wristband gets scanned by an elf and Santa’s “naughty or nice” book is automatically updated with the information so that he can talk to the children on a personal level. The solution has been installed by technology company Aptriva in partnership with bespoke NFC tag supplier and manufacturer RapidNFC. “Essentially what they’ve done is created an NFC-based software solution so when parents sign up online to take their children to the grotto, they also include quite personal information that nobody else would know, such as favourite teachers, favourite bands, favourite football teams, things like that,” RapidNFC’s Jack Sage explained to NFC World. “This could presumably be done with other forms of RFID or even QR codes or something like that but the experience is just not as good. You can imagine them trying to scan a QR code, for instance — it wouldn’t have the same effect.